In answer to GDPR regulations, we are introducing Candidate Anonyallows that allow you to keep Candidates data safe and not visible for not-signed users. This extension is available for download from client panel for Business License owners only. 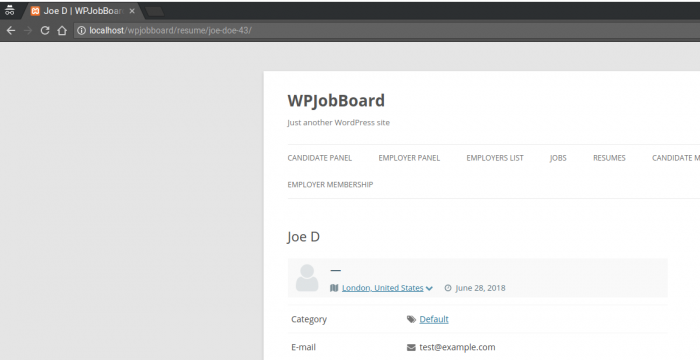 In order to use the integration, you need to download the Candidate Anonymizer from WPJB client panel and install and activate it from wp-admin / Plugins / Add New / Upload panel. Go to wp-admin / Settings (WPJB) / Candidate Anonymizer panel, you can fine-tune the integration to your needs here. We have 4 options, that allow you to customize anonymize your Candidates on a few levels. Hide Surname – If checked on each place where first name and last name of the Candidate is visible, users will see the only first name and the first letter of the last name (e.g. “Joe D.”). This also includes title param for the browser. Hide Surname Exception – This option allow selecting who can see full surname. You can grant access to full surnames to anyone who has account on your site or only Employers with valid premium membership. Please note, that Admin will always see full surname. If WPJB will encounter identical slugs, it will automatically add a number to slug, so e.g. next joe-d will be joe-d-2. Robots Restrictions – Sometimes your candidates do not want to be indexed in search engines, especially in Google and Bing. Checking this option will add no-index tag to the Resume Details pages and the search engine bots will not index the page and it will not show in Google search results. After configuration, you do not need to do anything to make this work. The only exception is a slug. Slug is saved in the database, and you need to resave all resumes to use a new slug. To make this quick and easy, we have added a bulk anonymizer in the configuration page. Just click “Anonymize Candidates” and wait for the process to finish. This can take a while depending on how many Candidates you have. For a big number of Candidates, it can take even a few minutes. If you close browser during the process, some of the Candidates may still have old slugs.